An emergency medical evacuation benefit. Learn the procedure to get the visa letter! The Schengen Agreement that was originally signed on 14 June 1985 by Five European Union members has now been broadened to include 26 European countries. These 26 Schengen countries have between them a population of over 400 million. These 26 Schengen countries have officially removed all border restrictions between their mutual borders which allows international travelers to travel in these 26 countries without any border crossing restrictions. The following nationalities need the Schengen visa even for short visits. However for longer visits (more than 90 days) almost non Europeans including US citizens need the Schengen visa. Travel insurance while made mandatory for foreign travelers for getting a Schengen visa is any event very important given the high cost of healthcare in Europe. The travel insurance plans that we offer work for travelers of all nationalities. Buying travel insurance for Europe and for Schengen countries on a website called Americanvisitorinsurance.com may appear contradictory. However while we mainly offer travel insurance for visiting the US, we also offer international travel insurance and Schengen visa travel insurance which are designed specifically to meet Schengen Visa requirements. Maryland, Washington, New York, South Dakota, Colorado, Islamic Republic of Iran, Syrian Arab Republic, U.S. Virgin Islands, Gambia, Ghana, Nigeria, Sierra Leone. 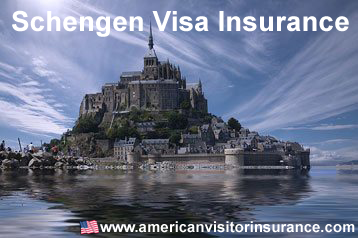 These insurance plans satisfy Schengen visa requirements for senior travelers. It also works well for residents of Maryland, Florida, Newyork and Washington states. Eligibility: The applicant must arrange a covered trip and must be a citizen or resident of USA. Key Features: No age limit for pre-existing conditions coverage. #1 Policy Maximum is the maximum eligible medical expenses that the plan will cover. #3 Click here for Schengen visa insurance plans available for residents of Maryland, Washington, New York, South Dakota, Colorado, Islamic Republic of Iran, Syrian Arab Republic, U.S. Virgin Islands, Gambia, Ghana, Nigeria, Sierra Leone..
#4 Click here for Schengen visa insurance plans available for residents of Maryland state. #5 Click here for Schengen visa insurance plans available for residents of Maryland, New York, Washington, Canada & Australia states. US citizens who want to stay in any of the 26 Schengen countries for more than 90 days in a 180 day period need a Long Stay Visa. One of the requirements for this visa is proof of medical insurance with medical expenses coverage up to 30,000 Euro (or the equivalent in US dollars) which is valid during the whole stay in the Schengen countries. The insurance company should provide a visa letter stating coverage amounts for medical expenses, emergency medical evacuation and repatriation while in Europe (or 'unlimited' if there is no limit of coverage). Medical insurance for getting the Europe visa can be purchased online both quickly and with ease. We have developed an insurance comparison facility so that an Europe Visa or Schengen Visa holder may compare quotes from several different insurance providers. All that the customer has to do is provide the relevant information (age, travel dates, total amount of coverage desired) in simple online form and then click on the 'get quote' button, and they will have instant access to a list of eligible plans along with the premium (cost), the medical coverage details, and the name of the underwriter. The Schengen Visa holder may then buy the medical insurance plan that they select by clicking on the corresponding 'BUY' button. To do so they must complete a simple online application and pay using a credit card. On purchasing the insurance, a traveler will be provided with the insurance details that include a toll free number, a virtual ID card, and a visa letter that may be presented to the consulate as proof of coverage. The maximum medical coverage selected: The options range from $50,000, up to $1,000,000, the higher the coverage amount, the higher the premium. The selected deductible: A 'deductible' is the amount of the medical costs the customer pays before the insurance plan provides any coverage. Most plans provide several options ranging form $0 to $2500 (travelers over age 60 years may not have the $0 deductible option). The lower the deductible, the higher the premium. The co-insurance on the plan: 'Co-insurance' is the percentage on medical expenses borne by the customer AFTER the deductible is paid off. Most plans do not have a coinsurance outside the USA. The insurance underwriter: There are different underwriters such as AIG, Lloyds, Nationwide, etc. Premium will correspondingly vary for different underwriter. Venice may conjure up images of romantic gondola rides down the Grand Canal, but this European city isn't only for swooning lovebirds. The Eiffel Tower is a wrought iron lattice tower on the Champ de Mars in Paris, France. It is named after the engineer Gustave Eiffel. There's more to Amsterdam than its notorious coffee shop culture and Red Light District. Spend the day biking along the city's canals and stylish streets. Athens was made for history buffs and architecture aficionados, but it also serves as a great European getaway for the everyday travel.